Angela May's Omaha Nebraska Real Estate Blog: Grand 2 Story Entry w/ Dream Kitchen now has added over 1,000 sq ft downstairs! Grand 2 Story Entry w/ Dream Kitchen now has added over 1,000 sq ft downstairs! Sellers just finished the lower level and added an additional 1000+ square feet - home is now priced at about $60 a sq foot - don't miss out on this one! Great location - walking distance to Elementary School & Walnut Creek. Grand 2 story entry with ceramic tile leads to Office w/ French doors. Pillars accent formal Living & Dining Room. Dream Kitchen boasts Cherry cabinets, pantry, ceramic tile, granite countertops and Stainless Steel appliances (all stay) and is open to Family Room w/ Fireplace. Spacious Master Suite includes luxurious jacuzzi tub (3 Bedrooms have walk-in closets)! Huge Lower Level with daylight windows & rough in are ready to finish. Nice corner lot w/ deck, stamped patio, 6 ft PVC privacy fence, sprinkler & more! 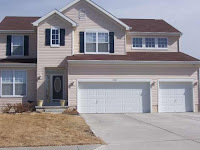 Please visit www.HuskerHomeFinders.com or contact Angela May directly at 402/709-4908 to view more pictures and to take a virtual tour or to schedule a private showing.